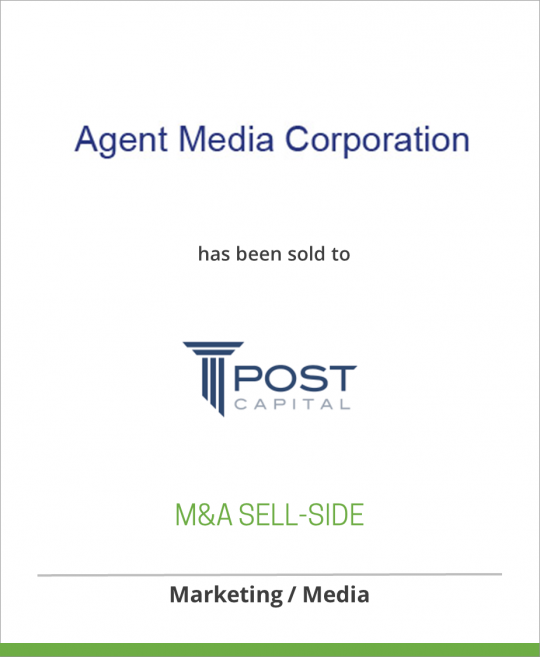 Agent Media Corporation, a direct marketing and publishing company serving the insurance industry, has been sold to Post Capital Partners LLC. Agent Media Corporation (“AMC”), which is based in Clearwater, Florida, is the pre-eminent direct marketing and publishing company serving the life, health and annuity segments of the U.S. insurance industry. Through a variety of media, AMC offers insurance marketers unparalleled access to the 880,000 independent insurance agents who write the vast majority of life, health and annuity policies. AMC’s range of products and services enable insurance marketers to reach independent agents efficiently in over 70 state and regional editions or on a national basis. The Company publishes Agent’s Sales Journal for independent agents as well as Insurance MARKETING for insurance marketers. In addition, AMC owns the largest and most accurate database of 880,000 independent insurance agents, each of which is licensed by one or more of the 50 states. Post Capital Partners LLC, based in New York City, is a private investment firm that invests in traditional small and middle-market businesses with solid fundamentals and a history of stable cash flow and/or attractive growth prospects. Post Capital makes primarily control investments and employs an investment strategy focused principally on partnering with proven and committed management teams. Post Capital’s entrepreneurial partner for AMC will be industry veteran Roscoe Smith.